AirAsia and All Nippon Airways (ANA) announced on 21-Jul-2011 plans to form a JV LCC in Japan to be called AirAsia Japan Co. The carriers expect the JV airline, which will be the first LCC to be based at Tokyo Narita International Airport, to commence operations in Aug-2012, subject to regulatory approvals. AirAsia Japan will be AirAsia's first venture outside Southeast Asia. ANA also plans to launch a Kansai-based LCC in early 2012, Peach, while there have been reports that a JAL-Jetstar LCC JV announcement is imminent. The AirAsia-ANA agreement marks the joining of AirAsia, southeast Asia’s largest LCC, and ANA, Asia’s largest listed carrier, the world's 10th largest airline by passengers and the world's eighth largest airline by revenue. The carrier will be established in Aug-2011, and the airlines will apply for its AOC in Sep-2011 or Oct-2011. AirAsia will hold 33% of the voting shares and 16% of the non-voting shares in the JV through its wholly owned subsidiary AA International Ltd, while ANA will hold the remaining 51%. The JV will require an initial capitalisation of JPY1 billion (USD12.7 million), of the authorised capital of JPY5 billion (USD63.4 million). ANA President and CEO Shinichiro, as quoted by Dow Jones, stated the plan is for AirAsia Japan to be profitable within the first year of operation. "We are targetting profitability from the first (fiscal) year of operation. Our challenge is to achieve profitability as early as possible," Mr Ito said. The JV will significantly entrench AirAsia’s brand in North Asia following AirAsia X's commencement of services to Japan early this year. AirAsia X operates to Tokyo Haneda at present, although AirAsia Group CEO Tony Fernandes stated that with the proposed LCC operating out of Tokyo, it would be odd if AirAsia X did not operate there in the future. AirAsia X's long-haul operation to Japan will help facilitate connections between AirAsia Japan and AirAsia Group's strong network in ASEAN and beyond. The "milestone" agreement also marks another step towards its goal of becoming one of the world's largest low-cost airline groups by 2020. “We now become the Asia in our name. We have really been ASEAN until this point. Our comfort zone was ASEAN so we are really taking a step to say we are ready to take on the whole of Asia,” Mr Fernandes stated in an interview with the Jakarta Globe. For ANA, the agreement will further the airline's efforts to be the dominant player in the Japan market, both in the full service and LCC arenas, using AirAsia’s experience and low cost business model to serve the high potential markets of Japan and Northeast Asia. ANA President and CEO Shinichiro Ito said the the two new partners came together because of rising “turbulence” in a growing and increasingly complex Asian airline industry. He said rising competition in Japan had posed a “big threat” to ANA that it was seeking to turn to its advantage by joining forces with AirAsia. Earlier this week he made similarly comments, stating it is "only a matter of time before discount airlines eat into the shares of established carriers" in Asia. Mr Fernandes added: “We are proud to extend AirAsia’s successful low-cost business model to Japan and further provide opportunities for everyone to fly to the destinations of their dreams with low fares. AirAsia Japan will not only boost economic growth between ASEAN and East Asia by providing better access to markets around the region, but also enhance links within travel, trade and tourism. AirAsia is proud to be identified as a low cost carrier partner to ANA, a very respected, credible and successful airline in Japan. This new joint venture is an important milestone in AirAsia’s growth as ANA is the very first airline partner to form a joint venture with AirAsia.” He separately stated, in an interview with the Jakarta Globe, that ANA first sought out a partnership with AirAsia three years ago. Operating under the AirAsia brand, AirAsia Japan will serve the “highly lucrative” travel market in Japan in addition to Northeast Asian destinations such as South Korea, Taiwan and China. The LCC will be based at Tokyo Narita International Airport Terminal 2 (ANA will operate from Terminal 1). ANA, in a statement, stated it has been seeking opportunities to launch a new low-cost business based at Narita and, "after analysis, has concluded that partnering with an existing low-cost carrier is the most efficient and strategically advantageous option". Mr Ito stated he plans to make the new carrier's fares about half or a third of the price that ANA currently charges customers. "We must be the lowest air fare in the market and we will fight very hard to ensure that we do that," AirAsia CEO Tony Fernandes said. In Japan, the aviation market is undergoing rapid transformation with developments including the expansion of Open Skies agreements and increased domestic competition from road and rail-based travel. In addition, Tokyo Narita International Airport, a major international hub serving Tokyo, is seeking to increase capacity with the introduction of a new terminal and is expected to attract many LCCs and foreign airlines. Narita suddenly has the space and slots to pursue LCCs because last year's expansion of Tokyo Haneda has resulted in a shift in some long-haul flights to Tokyo's closer-in airport. The total pool of slots at Narita is also expected to increase by 40% in 2013, with a large portion of the new slots likely to be allocated to LCC carriers. In a statement, AirAsia stated that both ANA and AirAsia “firmly believe that AirAsia Japan will be a success as the Japanese market possesses the necessary ingredients for growth such as the population’s strong propensity to travel, its high per capita income coupled with deep and significant internet penetration”. Mr Fernandes called the partnership a chance to enter "a market of 100 million people in what has been a very protected and closed market". AirAsia and ANA stated they are “optimistic” that the LCC market which is currently underserved in Japan will “be as well received in Japan as has been is in ASEAN”. The rationale for the JV is to bring “low cost airline travel to Japan to make it affordable to the average Japanese national to travel both domestically and regionally”. LCCs still only operate around 2.7% of the 3000 weekly international services to/from Japan at present. LCC penetration within Japan also remains very low, at 9.1%, although this is higher than the intra North Asia LCC penetration rate of 6.8%. As predicted by CAPA, there has been a flurry of LCC activity in recent months in the Japanese market. ANA, after beginning serious preparations to enter the LCC market three years ago, has also recently established an LCC, Peach Aviation, with Hong Kong's First Investment Group, with services scheduled to commence in Mar-2012. When Peach takes to the skies from its base at Kansai International Airport, it will operate with 10 A320 aircraft leased from GE Capital “to tap regional demand for leisure travel”. Scheduled to commence operations in Mar-2012 with domestic services between Kansai and Sapporo and Fukuoka, the airline aims to be carrying 6 million passengers by 2015, by which time it will have a fleet of 15-20 aircraft and operating international flights to key Asian destinations, including major cities in China and Taiwan. The carrier’s first international destination will be Seoul in May-2012. Peach, in which ANA has a 33.4% stake, is expected to turn a profit on an annual basis in three years and clear away accumulated debt five years after the launch. As part of the AirAsia-ANA agreement, both parties agree to "provide a covenant not to compete against AirAsia Japan save for an airline known as Peach Aviation Limited (Peach)". However the parties agree that “Peach is subject to a non-competition provision whereby Peach is not permitted to locate its base at Narita International Airport”. Japan Airlines also has a domestic LCC on the radar and reportedly plans to soon establish an LCC JV with Jetstar Airways, with services also expected to launch in 2012. The subsidiary would be Jetstar’s third in Asia, following Jetstar Asia (Singapore) and Jetstar Pacific (Vietnam). According to reports in The Nikkei, the venture would reportedly be capitalised at between JPY10 billion and JPY20 billion (USD124 million and USD248 million), with JAL and Jetstar each holding a 30% stake. A decision on which company will have management control will be taken later, according to the reports. Mitsubishi Corp and Toyota Tsusho Corp have reportedly been invited to invest in the deal, which JAL and Jetstar aim to finalise next month. Jetstar CEO Bruce Buchanan, in Feb-2011, told Jiji Press that the carrier was continuing discussions on the LCC partnership with Japan Airlines. In late Jan-2011, the CEO stated the carrier was “in the final stages” of negotiations with more than one Asian carrier to launch an LCC joint venture, with a geographic focus on North Asia, according to reports in the Australian Financial Review. 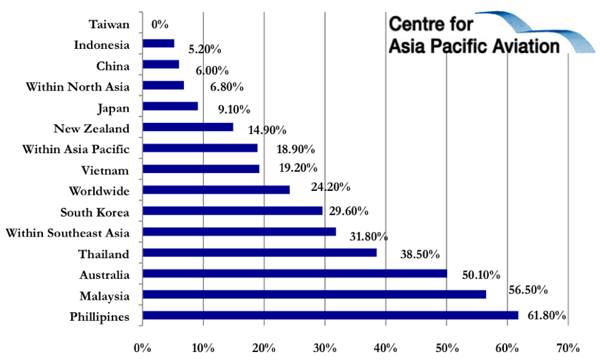 Targetted regions included Japan and China, where LCC penetration remains relatively low. Mr Buchanan at the time stated talks with JAL for the launch of an LCC JV were “progressing”, although he added “things in Japan take some time”. Qantas is set to make a major announcement on its international strategy in Aug-2011. The ANA-AirAsia tie-up is likely to create greater urgency for JAL to respond. Qantas Group has a close relationship with Japan Airlines, which includes codeshare arrangements on Jetstar and Qantas international services between Australia and Japan. The two carriers, in Nov-2010, reached an agreement to expand their codeshare partnership to include services operated by Jetstar on routes linking Japan's two major cities - Tokyo Narita and Osaka Kansai – with the Gold Coast. JAL has been bilateral partners with Jetstar, a subsidiary of oneworld alliance partner Qantas Airways, since May-2007. JAL also markets services operated by Jetstar that connect Tokyo Narita and Osaka Kansai with Cairns. The enhanced codeshare agreement will place Gold Coast on JAL's network map alongside Adelaide, Brisbane, Melbourne and Perth that are already served by codeshare services with Qantas Airways via Singapore. The move to establish an LCC was floated in 2010 although JAL Chairman Kazuo Inamori in Oct-2010 stated he had reservations about delving into discount airline operations. "I think we should refrain from chasing after scale expansion. Look at the US example, where many low-cost carriers that entered the market have since exited," he said at the time. JAL President Masaru Onishi around the same time stated the carrier would consider the creation of an LCC as part of its restructuring programme, commenting: “There is a lot of interest in low-cost carriers and we will research the issue and decide how to proceed". He added that nothing concrete has yet been decided on the carrier’s plan. Mr Onishi stated a potential LCC would be a “Japanese-style low-cost carrier”, although it would need to avoid the high operating cost structure characterising Japan’s carriers, which have long-standing problems such as high labour costs. Going back even further, Qantas in Nov-2009, when jostling was occurring between oneworld and SkyTeam related to Japan Airlines’ membership, pledged to advise the carrier in successfully establishing a low-cost offshoot, as it has successfully done with Jetstar. Qantas, with its “dual brand” structure, is perhaps the ideal partner to advise on establishing an LCC subsidiary, as the Jetstar model, working closely with the mainline Qantas, has been very successful. While the Japanese market conditions and route structures are very different from the climate in which Jetstar grew up, it would seem that Jetstar’s founders could offer some sound advice to JAL. Jetstar has been a lifesaver for Qantas, both in fighting off low-cost competitors and then in expanding the Qantas Group’s market - Qantas now uses Jetstar to substitute for it on long-haul routes from Australia, where the mainline carrier’s cost base makes operations unviable. The subsidiary, for example, recently took over the key Tokyo Narita route for Qantas, protecting the valuable slots from being lost to competitors. Apart from the possibility of supporting JAL into a successful LCC subsidiary, courtesy of Jetstar’s experience and support, there are clear potential advantages for both carriers if a successful venture were possible. A stand-alone JAL LCC, working with Jetstar would itself offer advantages for both sides: for example, Jetstar is highly connective, codesharing not only with its parent, but open to others as well. Working jointly to support each other would alone deliver strong market presence. And the possibility of a joint venture – which would offer a lower-risk option on both sides – would seem to be a good solution, with considerable upside. And the advantage for oneworld would be in a tighter long-term linkage into the Japanese flag carrier. For now, ANA has the inside running. The ANA-AirAsia announcement is a very positive development for a market which has been crisis-ridden in 2011. Next year is shaping up to be a massive year for the LCC sector in what has been a sleepy North Asian market.